After 20 episodes, Moon Lovers has ended its tale of love and power. But for all the deaths and tragic turns the story takes as it lurches towards the finish line, the shallow writing and rushed directing reduces what could have been tear-inducing drama to a dull glumness and utterly fails to realise the glimmers of potential we saw a few episodes earlier. That isn’t to say there weren’t any beats that resonated. Soon-deok’s (Z.Hera) death got to me because of my emotional investment in her character — especially when father (Sung Dong-il) mourned her demise — but I also appreciated that she got a chance to show off her fighting skills, even if briefly. Meanwhile, Eun’s (Exo‘s Baekhyun) deathbed apology to So was actually quite touching. It would have been nicer if we had seen more of Eun’s tender moments as part of a larger emotional maturation, or at least gotten less scenes of him acting like a prick. It also makes Yo’s (Hong Jong-hyun) guilt over killing his cousin less believable — though it was already much less believable based on his previous actions, not to mention the acting. That said, the moment Yo finally realises that his mother cares more for her ambition than her child is a profound one for his character, that has been subtly set up in earlier episodes for a well-deserved payoff. Queen Sinmyeongsunseong’s (Park Ji-young) own death is also an important character moment. Having exhausted all honest (even murderous) efforts to gain her affection, So exacts his revenge. But his vengeful act crumbles the second she passes, and he weeps for the love that he knows he will never receive. This is my first time seeing Lee Joon-gi in action, and I now understand what all the fuss was about. Lee has consistently delivered in each episode, doing his best to rise above the rise above the material. 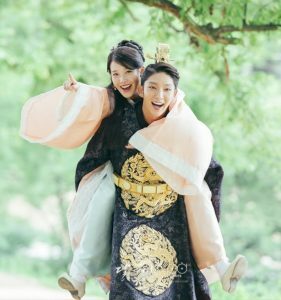 It would not be a stretch to say that Lee Joon-gi has carried this drama — he is too good to, and for, Moon Lovers. Ji-soo will also be remembered in a positive light, for the late blossoming of his character, 14th prince Jung. Maybe it’s because his character was able to do more than before all the time jumps, but we saw the energetic yet buffoonish prince mature into an accomplished man who is able to give Ha-jin (IU) what she desperately wants and needs, without hurting her like So and Wook (Kang Ha-neul) have. Knowing that his love is one-sided, Jung does what he can for Ha-jin as a friend. You can practically see the cogs whirring in Ji-soo’s brain as he tries to maintain the gait of a warrior, with his oh-so-seriously frowny face, but his chemistry with IU manages to cancel out much of the awkwardness, making him a soothing presence in the final episode. Nam Joo-hyuk and SNSD‘s Seohyun were also a win in the chemistry department, bringing the cute before their (admittedly extraneous) Romeo and Juliet-esque romance met a tragic end. I understood Woo-hee’s choice as a way to appease her people, but also to escape her own guilt — Ha-jin was right in calling her selfish. Speaking of Ha-jin, she was the weakest link in these last few episodes, which is especially frustrating since she’s a lead and the audience’s link to this Goryeo setting. It’s not that IU is a bad actress: she has already starred as the lead in You’re The Best, Lee Soon-shin to much praise, her performance being one of the few things that made the 50-episode drama a worthwhile watch. Some of the blame has to be apportioned to director Kim Kyu-tae, who doesn’t seem to have brought out the best in anyone here. But I also think that, at some point, IU simply gave up. After all, Moon Lovers is mainly a cash-grab and tourism marketing device before it is a drama; all she is required to do is look pretty and gape like a fish at the appropriate moments, so why bother doing more? Honestly, I don’t blame her. Ha-jin’s actions in these last few episodes border on confusing for some viewers. Why is she not OK with Wook’s ambition, but accepts So’s? Why isn’t she angrier at Chae-ryung (Jin Ki-joo), who not only betrayed her but contributed to killing a king, something she was so against that she dumped Wook? Why does she forgive Wook, after all the bad things he has done? And why is she so ho-hum about her pregnancy? I almost want to attribute all of this to depression, but that may be letting Moon Lovers off the hook too easily. I can accept that Ha-jin, knowing that So would become king, thought it futile to resist his quest for the throne. I can accept that Ha-jin’s pacifist concerns, and understanding that Chae-ryung was essentially groomed and used, clash with So’s absolutist rulings and actions. I can accept that Ha-jin’s need for inner peace allowed her to part amicably with Wook. With Ha-jin’s pregnancy, however, we were robbed of a goldmine of emotional turmoil. The delay of the pregnancy reveal was obviously intended to shock; but along with that shock came confusion and incredulity, as viewers were left to wonder what the implications were. Did the pregnancy have any influence on Ha-jin’s desire to leave the palace? I do not understand why we were not shown anything if this was indeed the case. This cheap thrill ultimately feels as manufactured as the envelope-within-an-envelope matter that kept So from Ha-jin in her final days. Considering its shorter timeframe of 20 hours, you would think that Moon Lovers would invest its time more wisely. Yet, we get little screentime for Ha-jin’s pregnancy, which would have been an important moment in that character’s arc. Instead, we are treated to another time jump following Ha-jin’s death, the events of which do little to endear me to the drama. Won’s (Yoon Sun-woo) remorse and death should be a positive, but it’s eight years too late. Wook is confined to his home (not that exile seems to be a well-enforced punishment on this show), and he manages to marry again and have a daughter. This is the point where I truly empathised with Ha-jin’s anger over Chae-ryung’s death: we see the little person receive harsh punishment, while the actual masterminds receive much more lenient treatment. At least So’s first meeting with his daughter provides us with a much-needed touching moment, though I still found myself thinking: isn’t Jung still in exile? Is So like Cady’s dad from Mean Girls, who also does not understand how the concept of confinement works? As we leave Ha-jin, now back in the 21st Century and crying over a dream that wasn’t (but no Lee Joon-gi appearance like in the original), I find myself wondering what the exact point of Moon Lovers was — beyond the economic gains. Though the title suggests an epic romance, what we got was something that took its time to get going, before coming to an insipid end. This is seen with the closing piggyback scene. It’s meant to ha a cute visual that recalls a great love that ends tragically. All I see, though, is a lot of missed chances. The most cohesive message to be found is of the futility of trying to control power itself. So makes all these claims about not being seduced by the throne, but using it to get what he truly wants: instead, we see him lose the people close to him, all three of them. Count this as another plus for Moon Lovers, though it is a lesson that may be imparted more effectively by other dramas. Readers, what did you think of Moon Lovers? Do you have any Lee Joon-gi drama recommendations for me? Please share in the comments below! AOA Jimin’s N-Word Scandal: Apology Done Right?